The Monongahela were a Late Prehistoric group of people who lived in the lower Upper Ohio Valley of southwestern Pennsylvania from circa A.D. 1050 - A.D. 1615/35. Many of their settlements were built on bluffs overlooking large river systems while others were hidden away on low terraces adjacent to smaller waterways. 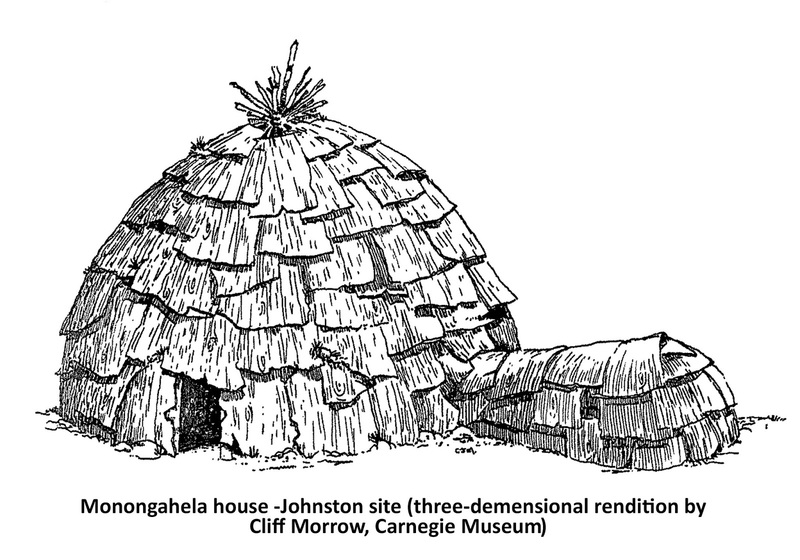 The typical Monongahela village can be described as a single or double ring of small round houses (domestic/storage/burial zone). Many of the houses also had a semi-subterranean pit that was free-standing or attached to the wall (Figure 1). Houses were built around an open plaza (communal zone) encircled by one or more gated palisades (defensive zone). An encircling ditch-trench, surrounding the palisade, was used as a convenient place for discarding trash (disposal zone) (Figure 2). Most villages covered an acre or more though some were enormous, approaching nine acres in size. 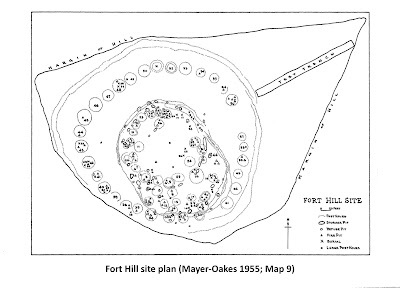 Village locations were re-used over time as is indicated by overlapping palisades and midden features of accumulated trash at some sites (Figure 3). During the 15th century the internal composition of Monongahela villages changed to include a single, larger-than-average, round house, a pattern that over time appears to have moved toward the outermost ring of houses. 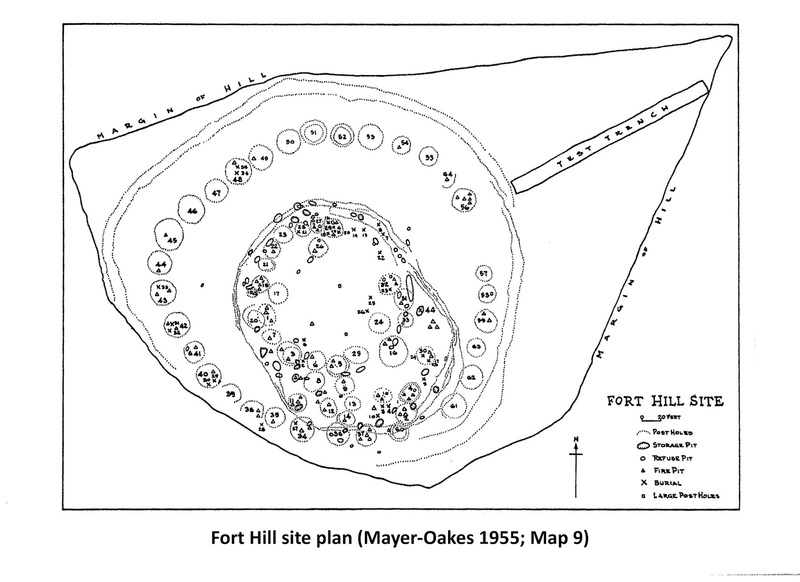 This type of structure was a place where some of the dead were interred, frequently exceeding more than 10 individuals (Figure 4). These so-called charnel structures may have been reserved principally for individuals, who were perhaps considered prominent members of the community i.e. headmen or others serving special roles or perhaps members of a certain lineage. There was, however, no general preference as to the gender or age of the interred individuals. By the late 16th century houses for the dead disappear from the archaeological record and infants and children are the only classes of individuals being continually interred in the common village household. Adult and elderly Monongahelans were evidently buried elsewhere which marks a defining moment in Monongahela mortuary practices from earlier times. 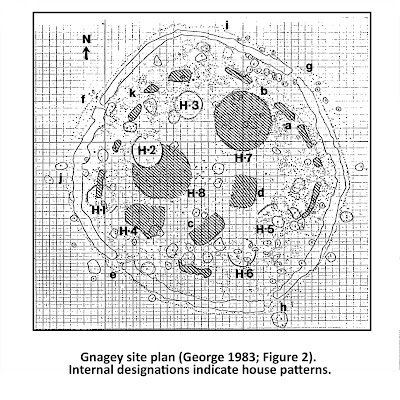 Curiously, by the proto-Historic period circa A.D 1550/75 Monongahelans began building large round-shaped buildings with semi-subterranean petal-shaped appendages at some of their settlements (Figure 5). Petal structures, like the smaller size Monongahela households had a centrally placed hearth where residents prepared and processed food. At colder temperatures, the hearth became the sole source of radiating heat both in households and petal structures. 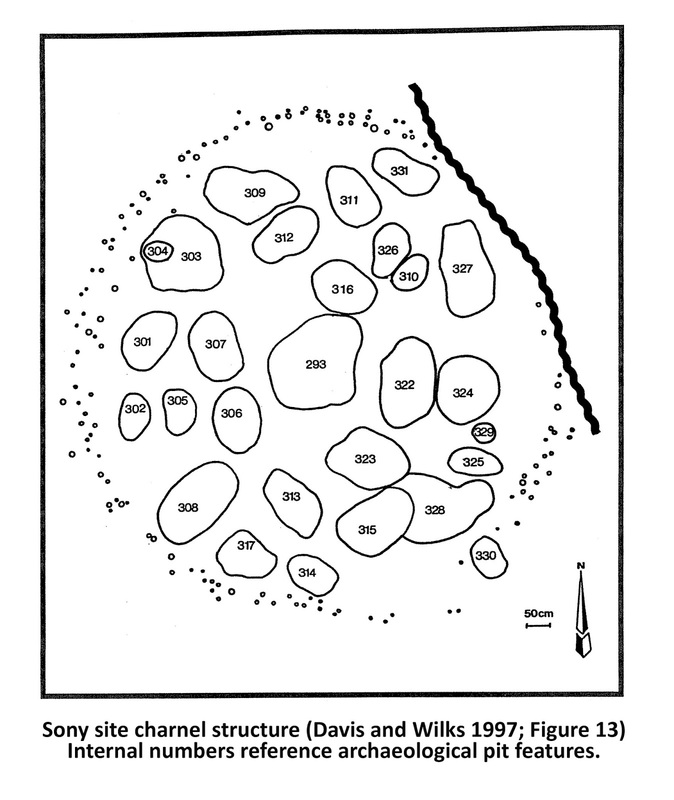 The archaeology at these sites suggests that newer petal-structures were often rebuilt on or very near the footprint of older ones thereby demonstrating a desire to reuse the same general locations through time. The number of appendages associated with petal structures varied widely. For example, at Sony, Throckmorton and the Foley Farm sites, archaeologists found as few as 11 to as many as 24 appendages attached to petal structures. An opening or doorway always appears on the northeast to southeast side of the petal structure. 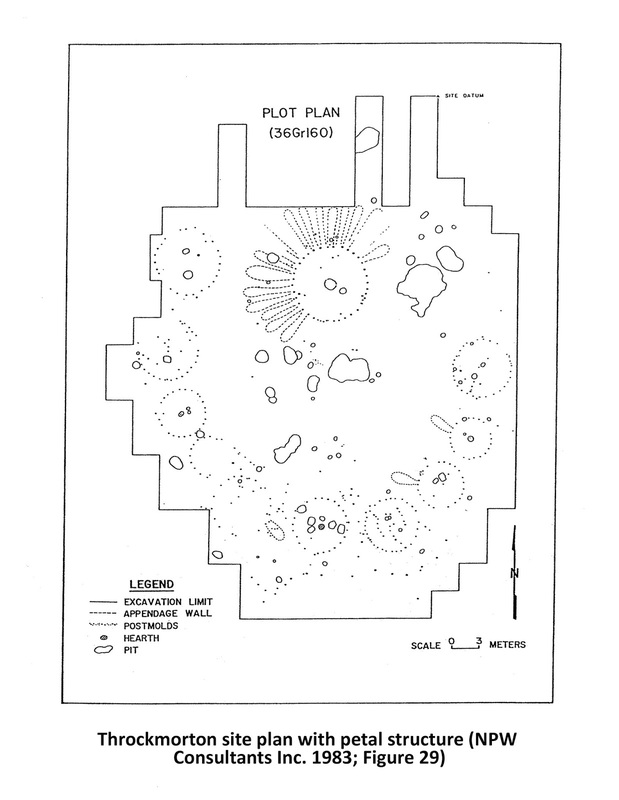 When petal structures were first incorporated into the ring of houses, as at the Throckmorton site, the doorway always faced toward the village plaza (Figure 6). The appendages associated with houses and larger petal structures are recognizably different in that the latter generally had a greater length ratio of nearly 2 to 1. There is a long-standing assumption by archaeologists that semi-subterranean structural features, whether free standing or otherwise, were used for storage of perishable foods and, no doubt, a resident’s personal effects. The function and purpose of Monongahela petal structures may never be satisfactorily explained since their morphology is generally comparable to Monongahela dwellings. That petal structures abruptly appear in southwestern Pennsylvania at the very end of the Late Prehistoric period when goods of the European trade begin to filter into the region from the eastern coast of North America seems clear from the archaeological evidence. With these changes in village architecture came disease, sickness and often death, to people who had little resistance to biological vectors of calamity. 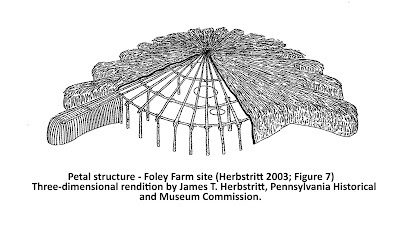 In summary, it is interesting to note that Monongahela villages grew from small settlements containing a half dozen or so houses to enormous settlements covering many acres followed by a recognizable reduction in village size in the closing years of the Late Prehistoric period with the appearance of petal structures and the disappearance of charnel structures in the Monongahela core area of southwestern Pennsylvania. These archaeologically deduced observations leave us with many unanswered questions regarding the driving forces that forever changed the settlement, community and mortuary patterns of a disappearing people called Monongahela. We hope you’ve enjoyed this glimpse into the past at the Monongahela peoples who occupied Pennsylvania during prehistoric times and invite you to visit other blogs on TWIPA which discuss the Monongahela. Understanding and exploring our archaeological heritage is pivotal to our understanding of human behavior and our ability to change and adapt over time- just as the Monongahela peoples did for hundreds of years. 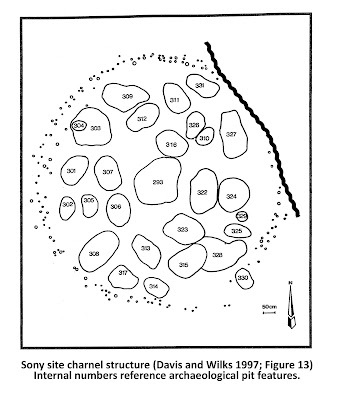 1997 Phase III Data Recovery Sony Site, 36WM151, Westmoreland County, Pennsylvania. A Cultural Resource Management Report prepared for the Westmoreland County Industrial Development Corporation. 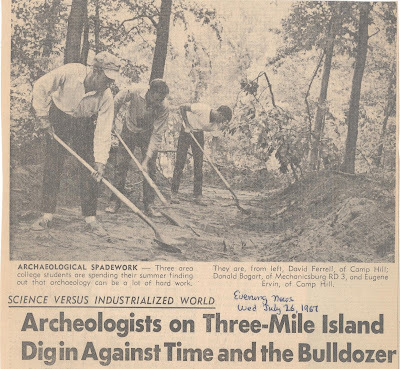 1955 Excavations at the Johnston Site. Pennsylvania Archaeologist 25(2): 86-141. 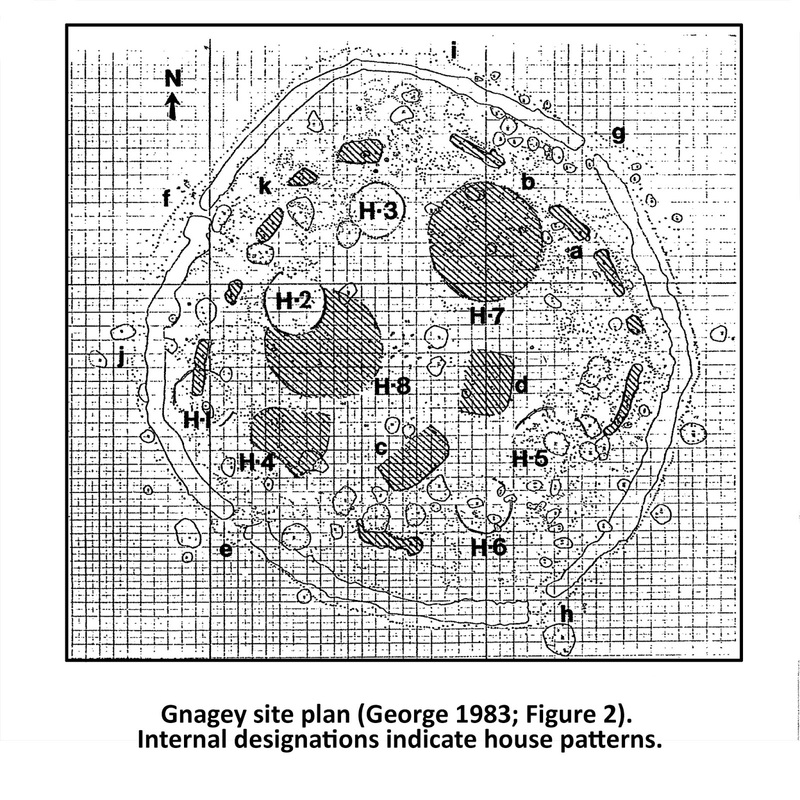 1983 The Gnagey Site and the Monongahela Occupation of the Somerset Plateau. 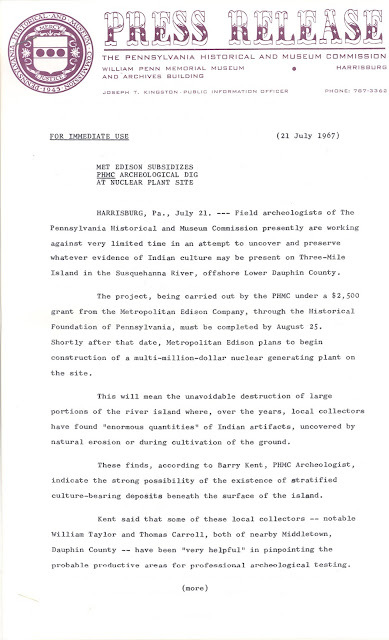 Pennsylvania Archaeologist 53(4): 1-92. 2003 Foley Farm: The Importance of Architecture and the Demise of the Monongahelans. 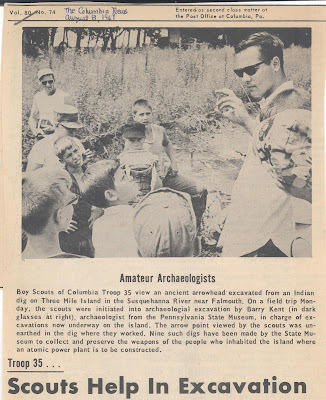 Pennsylvania Archaeologist 73(1): 8-54. 1955 Prehistory of the Upper Ohio Valley; An Introductory Archaeological Study. Anthropological Series No.2. Annals of the Carnegie Museum. 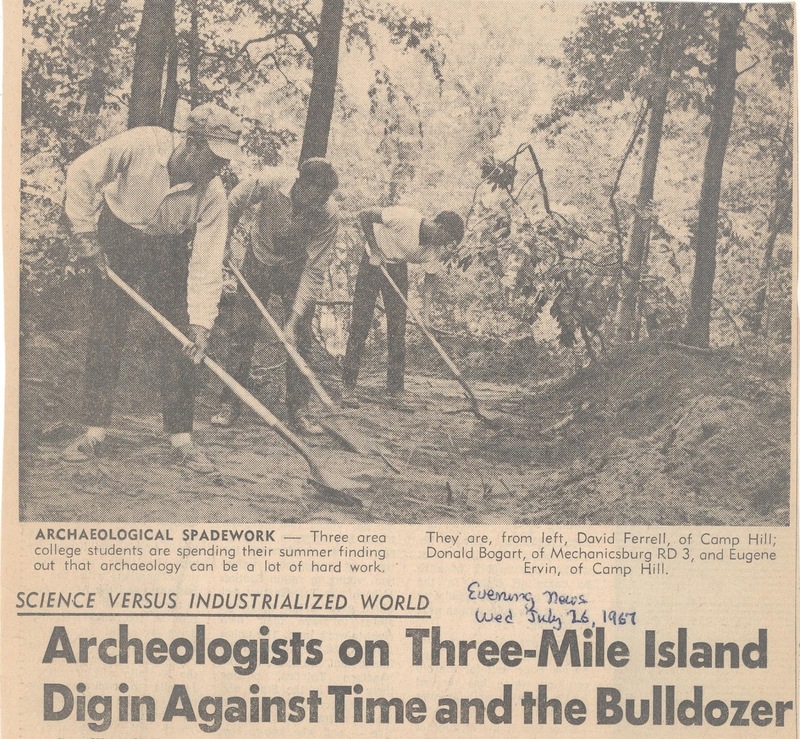 With Three Mile Island once again in the headlines as of late, what better time could there be than now to share some additional information about the archaeology of the island that hosts the nation’s most infamous nuclear power plant. Residents of central Pennsylvania (of a certain age) can recall exactly where they were and what they were doing when they received word about fears of a meltdown at the plant in late March of 1979. Truly a “where were you?" moment in history outdone only by the disasters at Chernobyl and, more recently, Fukushima. Avid followers of TWIPA will recall a previous post thoroughly reviewing the excavation and artifact analysis of the northern-most site on the island, 36Da50, and it can be found here. 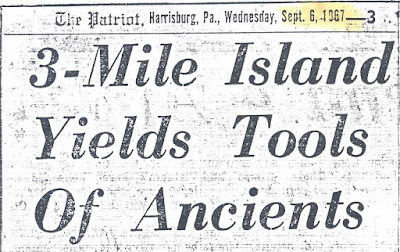 There have been, over the course of the last 50 years, eight additional archaeological sites registered on Three Mile Island. First, enjoy a few newpaper clippings and the formal press release from that initial work conducted in 1967 that are now themselves as of this year technically, historic. The Middle Woodland cord-marked storage vessel seen below was excavated, and ultimately donated by Monroe Brown to the State Museum where it was then reconstructed in the early 1970s. Assigned to site 36Da52, the provenience information indicates it was discovered eroding out of a pit on the southern bank of the island. Generous contributions like Mr. Brown’s go a long way in enhancing our collective understanding of Pennsylvania prehistory. 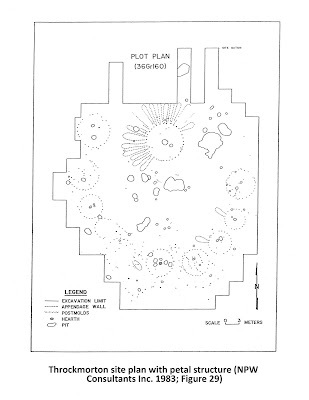 Sites 36Da96 through 36Da99 were recorded with the Pennsylvania Archaeological Site Survey in 1976 and are attributed to the work of Tom Grace and others. 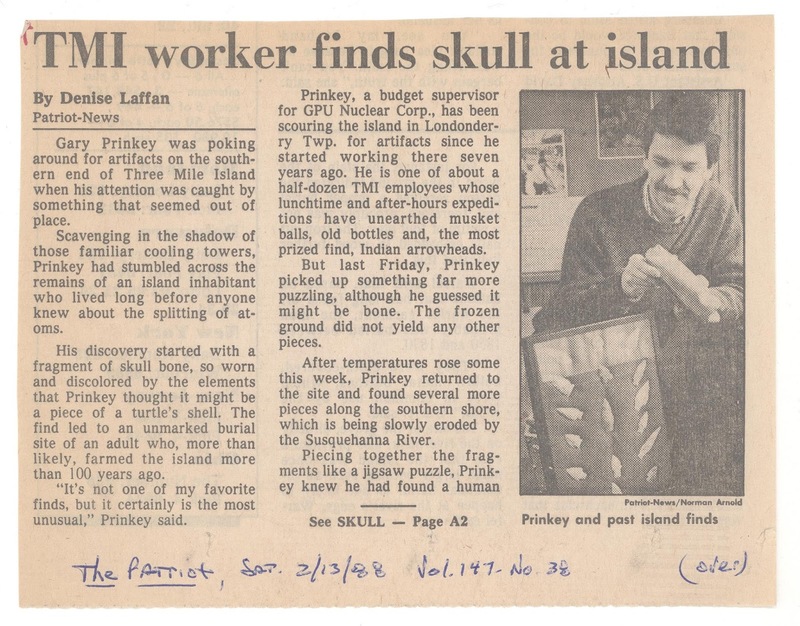 Mr. Grace worked at TMI as GPU Nuclear’s environmental licensing engineer, and for several years, as weather and time would permit, he would hunt for artifacts on undeveloped parcels of the island. 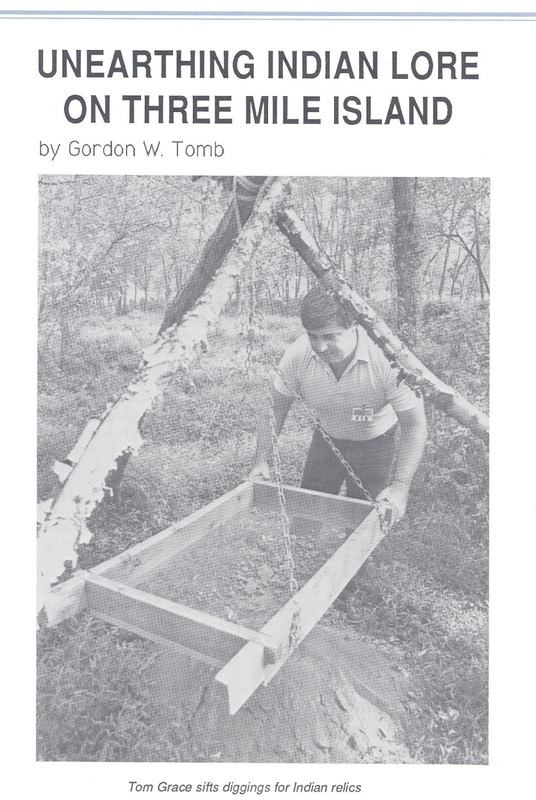 His enthusiasm for archaeology and some of his discoveries were highlighted in the fall 1987 edition of GPU Nuclear Today, a periodical published for employees working at the plant and their families. His findings were consistent with earlier work and reinforced ideas about how long people had been occupying the island. 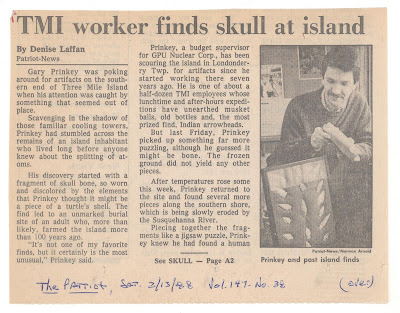 In the 1980s, another employee at TMI, Gary Prinkey, was also scouring the island for artifacts. On one excursion, he uncovered a fragment of a human skull eroding out of the bank of the island. Unsure whether the deceased was a victim of crime, Prinkey notified the State Police. State Museum of PA curator of archaeology Steve Warfel was contacted and investigated the grave site with Trooper John Brown in February of 1988. The presence of wood fragments and cut nails indicated to Warfel the remnants of a coffin, dispelling any notion of nefarious deeds. Furthermore, vest buttons recovered from the site (36Da101) were identified as a particular type manufactured between 1850 and 1880. Likely an inhabitant farming TMI in the late19th century, their remains were re-interred further inland on the island after analysis. In the mid-nineties archaeologists re-identified site 36Da51, the second of three sites originally recorded in 1967, during survey and evaluation work in connection with a proposed fish passage facility on the southeastern side of the island. Phase II work determined that what was initially considered a buried A horizon containing chipping debris, a few sherds of Early/Middle Woodland ceramics and FCR was actually the historic plow zone from 19th century farming activities. The disturbed nature of the soils in the the project area precluded any additional archaeology. Finally, the most recent archaeological investigations on TMI were conducted in 2014 in anticipation of a “Nature-like Fishway” construction project on the southwest side of the island. At this site, 36Da100, archaeologists observed stratified and sealed deposits, the earliest of which contained a Thebes projectile point made of jasper. Thebes projectile points are classified as Early Archaic in age and date between 10200 and 11700 years before the present. Due to its potential to contain significant new information, this site has been determined eligible to the National Register of Historic Places. If construction plans cannot be designed to avoid the site, a data recovery effort may be necessary to mitigate adverse effects the project may have on this important cultural resource. 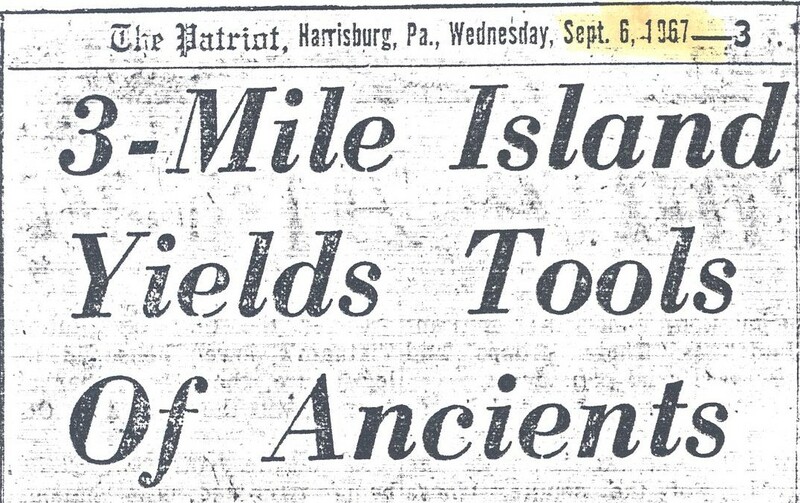 For archaeologists, there’s just no such thing as TMI about TMI. 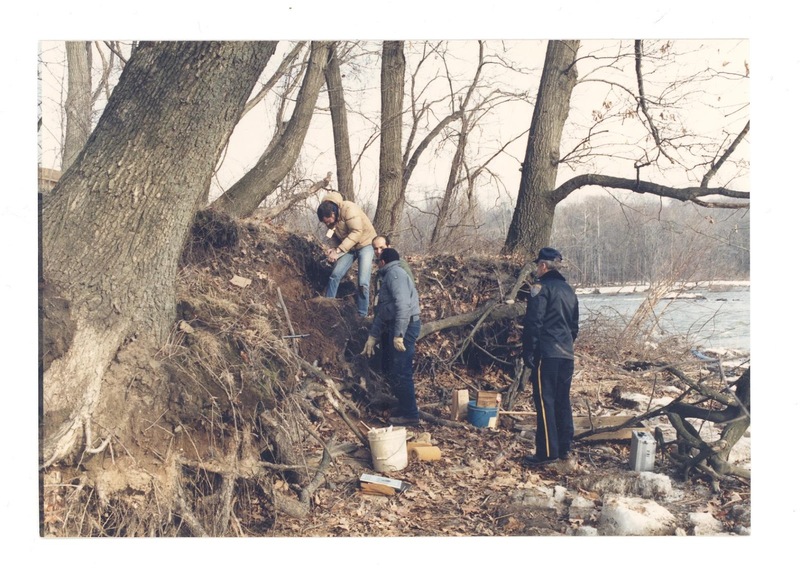 Phase I Archaeological Investigations for the proposed Nature-like Fishway at the York Haven Hydroelectric project. Brockington & Assoc.